In Liverpool, which is still adapting to a post-industrial economy, shopping may not yet have reached the level of intensity celebrated by Shopping – a century of art and consumer culture, which is on show at Tate Liverpool until March. 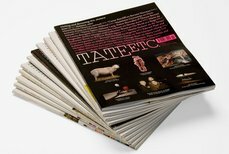 It is the biggest exhibition Tate Liverpool has ever hosted and is the result of a collaboration between Max Hollein, director of the Schirn Kunsthalle in Frankfurt, and Christoph Grunenberg, the director of Tate Liverpool. Andy Warhol, the great acquisitor, predicted that: ‘All department stores will become museums and all museums will become department stores,’ and this exhibition looks at the ways in which artists have been influenced by consumerism in the past century, and at similarities in the ways art and consumer goods are presented and sold. Anybody looking for a critique of global capitalism won’t find it here: the curators have a positive view of consumerism. Though criticism is implicit in some of the individual works, the exhibition does not subscribe to what are – in the curators’ view – old-fashioned theories about the evils of advertising, or the immorality of excess. ‘We want this to be an affirmative exhibition about shopping,’ Grunenberg said. ‘We want to get away from the old stereotypes and to present the evidence for artists having always been fascinated by the rituals of shopping. There has been a significant shift in the last 10 to 20 years, especially in academic theory, away from a criticism of consumerism. Occasionally there is a Marxist hiccup, where people think everyone is brain-dead and has been completely manipulated; that everything is sold by appealing to our deepest complexes and sexual desires, which is ridiculous. Think how many products – from magazines to breakfast cereals – are launched every year, and 90 per cent of them don’t make it. So we are all making choices all the time. I think it’s a fallacy that we can escape the desire to want to have new things, to buy things. We have to accept it, to be conscious of it, and accept that when we buy something it’s because we like it, and it signifies something about ourselves. It’s nothing to be ashamed of. In some ways, putting together an exhibition must be a bit like shopping. You make a wish list, you find out where you can get the items on it, you check the prices to see if you can afford them, then you acquire those you can, and work out where to put them to best effect. In that sense the curators have done a sensational job, pulling together well over 200 exhibits, including major works from museums and private collections around the world. In some cases installations have been recreated especially for the show, and in others artists have made new works which are exhibited here for the first time. In support of this statement are works from a long list of artists, most of them made during the past 20 years, which make direct reference to advertising, to promotional displays and to the psychological strategies that retailers employ. There are photographs by Richard Prince, Wolfgang Tillmans, Martha Rosler, Andreas Gursky; installations by Jeff Koons, Sylvie Fleury, Haim Steinbach, Damien Hirst, to mention only a few. And though this exhibition covers most of the past century, it really warms to its theme after the mid-point, when Pop artists began to acknowledge in their work the dominant role of popular culture. The curators were keen not to make an exhibition that concentrated on Pop, but this is the point at which art of the last century made its greatest shift, when principally American and British artists began to borrow the imagery and strategies of mass consumption – from the media, advertising, marketing and retailing – re-presenting them as art. One of the key exhibits is Warhol’s American Supermarket, a work recreated for this exhibition from photographs of its original installation inside the Bianchini Gallery in New York in 1965 (making it, rather fittingly, a replica of a replica). A collaboration between Pop artists, including Warhol, Jasper Johns, Roy Lichtenstein, Claes Oldenburg, Richard Artschwager and Robert Watts, it sold fake goods, at rather inflated prices, in a stylised supermarket setting: Artschwager made the turnstile check-in, Watts supplied boxes of brightly coloured velour-covered fruit and veg. His chrome eggs and wax eggs sold at $12 for half a dozen.Roy Lichtenstein’s Turkey bags were $12 each. Warhol – going one stage further – was selling signed ‘authentic’ Campbell’s Soup tins for $18. It mimicked what it mocked: the gallery became the supermarket; the objects could be mass-produced, everything was for sale, and there was little correlation between the cost of production and the market value. The featureless modern halls of the Schirn Kunsthalle adapt easily to the mall aesthetic. The designers have kept the lighting cold and bright, the floors hard and shiny, even the air seems to have the odourless, germ-free chill of a giant supermarket. And, since so many of the artists have chosen to replicate retail products and retail spaces – the shop, the store, the supermarket, the boutique – moving from one artist’s work to another’s is a very similar experience to walking through a shopping centre, or a department store. Visitors enter the exhibition through a perfect replica of the modern supermarket. It is an installation conceived by the artist Guillaume Bijl, and supplied by a German supermarket chain which will replace the perishable goods regularly, as they would in their stores. In Liverpool, Tesco is stocking the shelves. Apparently there was an initial worry that the association would be detrimental to Tesco’s image. If so, it is the first commercial enterprise to be concerned about the fashionable liaison of its brand with the name of a contemporary artist. Putting together an exhibition is like shopping. You make a wish list, check the prices, acquire those items you can afford. In the context of the museum, Bijl’s supermarket announces itself as an aesthetic ‘experience’. Inspecting the ranks of tins and cartons, the unbroken pyramids of fruit and veg, the lines of yoghurt pots and blocks of butter before reaching the deserted checkout, makes one acutely aware of the formalism and the ruthless pragmatism of the layout. There is also something slightly spooky about it; a bit like being locked inside an empty store where all the shelves are restocked, but the staff have disappeared. The first half of the 20th century is largely represented by photographs: storefronts by Atget in Paris, by Berenice Abbott in New York and by Walker Evans in the American South; shop window displays by Josef Albers, Man Ray, Germaine Krull, Umbo and Duchamp; all concerned with the surreal qualities of the mannequin and the theatricality of the space behind the glass. This section of the exhibition culminates in the work of Frederick Keisler, an Austrian who moved to New York in the 1920s and applied the tenets of the Bauhaus to window display. His book, Contemporary Art Applied to Window Dressing, was published in 1929 and his ideas put into practice at Saks Fifth Avenue. Keisler studied not only the arrangement of objects, but the psychological exchange between the customer and the object, the contract between attraction and desire. He wrote: ‘Which is the most provocative: the curiosity to look into a neighbour’s window, or the window which lures us to look in?’ This axis is at the heart of retail psychology. To ‘create demand,’ Keisler wrote in 1930, ‘you must stimulate desire’. Newness, the bourgeois promise of self-improvement through consumer goods, the idea that shopping holds the key to a more successful life: the American artist Jeff Koons understands all this; newness, he realised (since need was not in question), was the quality that consumers were addicted to. In the late 1980s he made a series of works called The New, which exhibit Hoover vacuum cleaners – the basic domestic appliance – inside Plexiglas cases, illuminated with fluorescent lights. Thus displayed, they took on all the allure of rarefied objects under glass. Set on pedestals and displayed in a gallery context, they acquired the desirability of works of art. When they were first shown at the Saatchi Gallery in London in the 1980s, they appeared to be simply exercises in kitsch; in the context of this exhibition, as part of a discussion of the psychology of display and the desire for inanimate objects, they make perfect sense. Specific artists’ works are grouped or juxtaposed to make a particular point in the exhibition. Before Koons comes Beuys, who is near to Fluxus, next to Christo – a little corner of dissent. These are works which in their time ran counter to the politics of consumerism. Beuys’s installation Economic Values from 1980, for example, displays a selection of no-brand East German products in plain brown packaging on basic metal shelving surrounded by paintings made during the time of Karl Marx: part of the Beuys mythology and, more prosaically, about the division, pre-Fall, between East Germany and West. The Fluxus shop (European Mail-Order Warehouse/ Fluxshop, from 1964, rebuilt in 1985) represents the group’s aims to subvert capitalist values by retailing useless objects using the same distribution channels as the free market (in this case by mail-order). Christo’s Four Store Fronts Corner, from 1964, is an installation of four shop windows, totally blanked out by sheets of canvas; there is also an early, wrapped, supermarket trolley; but compared to the shiny newness all around them, they offer a very subdued rebuke to Mammon. Andreas Gursky, who has studied both mass production and mass consumerism in his large-scale photographs during the last 15 years, is represented by four photographic works which hang, one to a wall, making the viewer the axis of the space. Three of them are photographs of retail displays inside a branch of Prada – Prada I 1996, Prada II 1997, Prada III 1998. The fourth work, a diptych, is of the tightly packed shelving systems of an American 99 cent store (99 Cent II 2001). The minimalism of the Prada store, its delicate shades of pink and eau-de-nil, is the backdrop to a carefully restricted number of small black objects – shoes in one, tiny stacks of folded black sweaters in another. The displays are subtly lit to emphasise the ‘architecture’ of the space and fuel the illusion of high restraint and taste. This is the atmosphere, the aura, the cult that the Prada customer is buying into. In the third Prada photograph, the display units are empty. The aura, however, remains intact. If ever Andy Warhol came back to earth, he’d soon find his way to Prada’s new ‘flagship’ store on the corner of Prince Street and Broadway in New York. Until the end of last year - and the irony is not lost on the neighbourhood – this was the site of the SoHo Guggenheim. Now the Dutch architect Rem Koolhaas (architect of the Las Vegas Guggenheim) has designed a shop that bears little resemblance to a retail environment and is much more like a gallery or small museum. Rather like Tate Modern, it makes its aesthetic statement with a huge area of empty space. Most of the ground floor has been removed to create a basement amphitheatre with tiered ledges where visitors sit before entering (or not) the spaces where the clothes hang on display. These are small and cool and lined with opaque glass. The ‘exhibits’ are, for the most part, black. Christoph Grunenberg said that, on a recent trip to New York, the Prada store was the most interesting exhibition he’d been to; and he wasn’t altogether joking. Born in Frankfurt, living in Liverpool, he is in a good position to judge the economic differences between the two cities. Frankfurt is a rich city. All the big luxury brands are settled here. It’s a very different context than Liverpool. Though it’s not as if shopping is an activity that people don’t do in Liverpool. There have been surveys into brand awareness in Britain, and the north-west is one of the highest-scoring areas in the country. They buy their leisure wear and their Nikes; they have Gucci, they buy Paul Smith and Lacoste. People like to shop. The nadir of the shopping experience is best represented by Damien Hirst’s Pharmacy, a full-size replica of a modern chemist’s shop, made in 1992 and part of Tate’s permanent collection. In fact, with its artillery of drugs and potions lined up in cabinets behind glass; the white shiny counter, the bottles of magic elixirs in primary colours, it is more like one of those European apothecaries than a cosy British chemist shop. Standing in this chemical supermarket, surrounded by curatives, there is a chill in the air, a whiff of the morgue. After all the smart little boutique displays, the exercises in kitsch and visual irony and free-market values, the message is that the buck stops here. You can, if you want, shop yourself to death; you still can’t shop yourself out of it. Article: Who was Gretchen Bender?